Events that are scheduled annually have the effect of giving character to a school. Many of Mt. Helix Academy’s annual events occur because of a supportive Parent-Teacher Group (PTG). All of the events are designed to be fun, some are fund-raisers. Below is an annotated list of our annual events. On the Thursday evening of the week prior to the start of the school year, Mt. Helix Academy holds our Back-to-School Potluck Social. The event is a wonderful opportunity for parents and their children to meet our teachers and to socialize with one another. 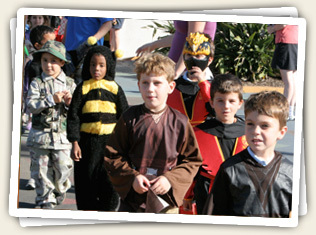 Kids love dressing up for Halloween and showing off in our parade. Late in the month of October, the PTG sponsors a fun-filled Halloween Carnival for students and their families. Students and parents come to the Carnival dressed in the most fascinating costumes and try their luck at a variety of games of chance. Another social event is our Fall Feast, which takes place each year before Thanksgiving recess. Held each year on the last Thursday of March, Multicultural Night has truly become one of the most popular highlights of the Mt. Helix Academy year. 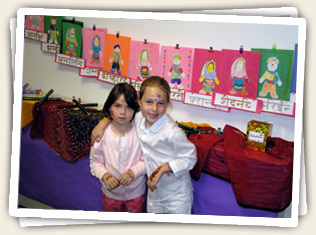 Students, their families, and friends immerse themselves in the multicultural world that is Mt. Helix Academy sampling delicious foods from the world’s many cuisines and touring the school’s authentically decorated classrooms, which has been a valuable way for Mt. Helix Academy students to display what they have learned concerning other cultures. Multicultural night is an event to behold and these kids show they are ready. Each December and June, Mt. Helix Academy presents its Winter and Spring concerts. Under the direction of Ms. Tanya Sussilleaux, students in Kindergarten through 5th grade showcase the songs and music they have been practicing in their regular music classes. 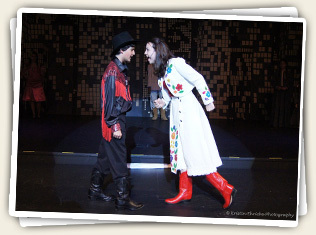 In our production of Annie Get Your Gun, Annie Oakley, played by Baley LaFlam, lets Frank Butler, played by Matthew Ross, know in no uncertain terms that she can do anything he can do better. Mt. Helix Academy’s Jog-a-Thon is an extremely popular fund-raiser among students, faculty, and parents. Students enlist sponsors who may make a general donation for the event or donate money per lap that the student completes. Another great social event organized by the PTG is Bingo Night. Families get together for great food and lots of fun playing bingo for a variety of prizes designed to appeal to all ages. In June, we have a Field Day of fun and games. Students are organized into teams to play a variety of games including water balloon toss, watermelon eating, volleyball and others. In addition to the games, students have a BBQ lunch. On the last day of school, graduation ceremonies are held for students in Kindergarten and in Grade 8. Graduating students, their friends and families are invited to celebrate this important milestone.